If you think that you know all kinds of hydroelectric then you are notch in mistaken .. Here I have invented a new type of hydroelectric power plant that uses water fall produced by waves.. 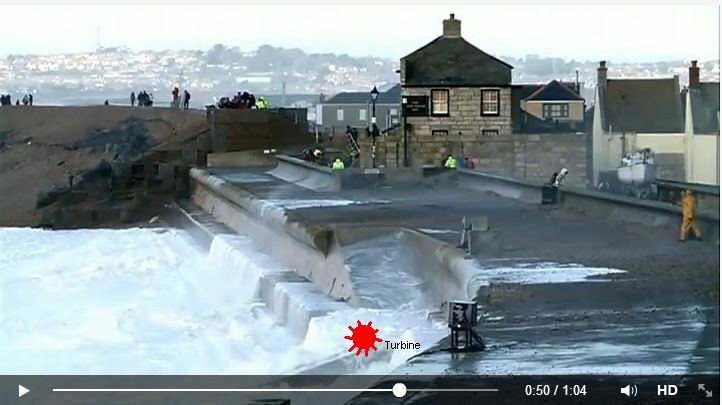 The turbine is to be the trigger salt water back into the sea. Here some drawings that explain. You can build a special vortex, as there is a high coast. And the picture only in the world peak power pump salt water. But pump water upwards through the for feedback electrical current. I propose that the water pump teeth using sea waves-moving pumps with valves ..
With some clever valve configurations it could pump water on both the upstroke and the downstroke. Yes, this requires the development of this idea .. Here also, how to pump the water to a high reservoir, initially using small of pressure ..
A big thanks AndrewF .. Here we see that nuclear power plants and water are exposed to blowing up .. My idea of ? ?all the tanks of salt water, to build on the high coast of the sea, is very safe and resistant to the threat of terrorism .. Because if even jtos shaft blow tank, the stored water, practically this water will not do any damage, because the drain into the sea, which is near ..
Now we see the picture, the upper lake with an area of ? ?1.2 km sqare .. gives you energy for 8 hours, 700 MW ... or 24 hours it would have to be 3.6 km sqare .. Imagine this upper lake measuring 8 km x 8 km = 64 km sqare ..
64/3, 6 = 17 .. now 17 x 700 = 12, 000 MW ~ .. 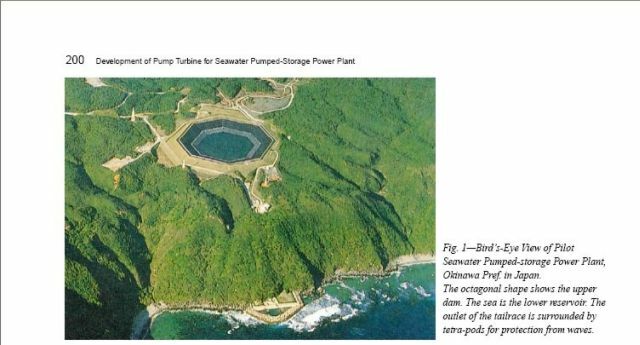 I think, if you live in an uninhabited country, that coastal hydro makes a lot of sense. But at least where most of us live the idea of flooding the coastal plains is a fairly drastic solution, not much different to the threats of rising sea level which may or may not turn out to be significant..
Nuclear power plant of 800 MW shall be adopted for the area of 5 x 5 km ... 64 km square So it have any 3 such power ... but here is 12000 MW of free space for 15 nuclear power plants .. that is the difference, ie 12 will surface to be used for example to residence .. of course, the surface of the sea with swimmers will be pumping big ..
Can someone pay me for finding 300 square km of free land in the UK? That if to fill all unused spaces up on ships with this polystyrene foam, most probably they stood unsinkable . a lot of people so that it is possible to rescue. Tupolew 142 have 80 ton weight 80 x 15 = , need 1200 pieces bottles this foam . All cost of foam 80 x 80 $= 6400 $. 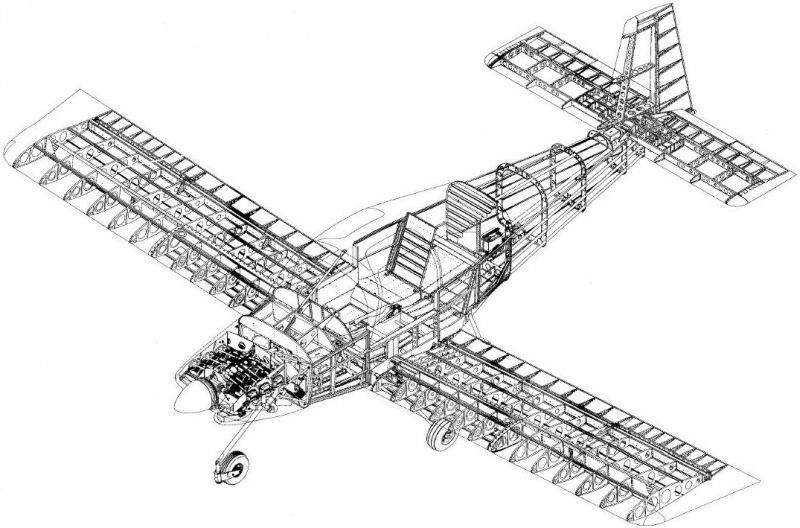 It is only 1% of the total weight of the aircraft. Wig area is 311 m^2 , 80 m^3/ 312 m^2 = 0,25 m the average amount of surface foam on the inside wings. I think that in this plane is so much unused space. And such buoyancy of the aircraft would also be found useful for Airbus over the Atlantic, as well as the Boening over Hudson. Anyway, but now it comes to airplanes .. According to my old calculations in 1 square meter for the TU 142 to have a buoyancy should be an average of 25 cm of foam .. or on each side of the plate from inside the 12 cm ... It's such a little thicker siding ..
"That if to fill all unused spaces up on ships with this polystyrene foam, most probably they stood unsinkable ." My criticism of this idea "Also off the subject". Even more TOXIC SMOKE in case of a FIRE. I subscribe to this thread and have always enjoyed your posts, so keep them going. Regarding the use of foam to prevent aircraft from sinking when lost at sea, I don’t have the statistics, but anecdotally, I assume that most deaths are not due to drowning, but due to impact, or other high energy violent endings. I believe the scenarios you are discussing likely have adequate solutions in place (life rafts, etc.). I think an excellent area for the use of that type of foam would be in help reduce the death toll for passenger and roll on/off ferry accidents. These seem to happen in rough seas, or in overcrowding conditions with sometimes large loss of life. Thank you very much Richard for a good link and my subscriptions. I Normally you need only the broad outlines of the new ideas I present .. they require much development, by many people .. then they really for us is profitable .. Such inspirational posts like yours, Richard causes that describes more about the innovation .. Here I would like to say that the majority of pilots for emergency landing was going to make sure you water, if she was sure that the plane did not sink .. The waters, even on land is not much, for example, a lake or river. This launch is a big advantage. There is minimal risk of fire aircraft .. The most spectacular example is the "Miracle on the Hudson"
Here you can see how little is needed to plane could swim .. The plane actually has a tower of different things. plumbing, electrical .. But still has Most sending of empty unused space. . Of course you have to think 10 times, where we can insert each of 1 decimeter foam. Part needs to be done easily removable, in plastic bags or specially shaped profiles, that can be had for service to remove and after the back insert. It's a plane, one of the most complicated machines .. in addition with the high standards of reliability .. so it will not be pumping air into the inner tube ..